A robust red wine with fruit forward fullness. Grown with dry-farming methods in Santa Barbara County and kept in American Oak barrels for 12-20 months. Winemaker: J.P. Pawloski of River Run Vintners. Our newest Zin release is beautifully complex yet balanced, filling your mouth with rich blackberry fruit, and a chocolatey licorice finish. This vintage is the first we've ever produced from a fourth year of drought, and we're especially excited to announce that this the best Zin we've ever produced or tasted. As typical of our Zins, you can drink it now or lay it down for years to come. This release of our Zin warms your mouth with raspberry and cherry fruits forward followed by a black licorice finish. The 2014 harvest, our third year of drought, produced only 51 cases of Zin. The smaller grapes, with a higher skin to juice ratio, show the promise of a very intense, full-bodied Zinfandel. With the third year of drought, our yield was low as we only produced 66 cases of our beloved wine. 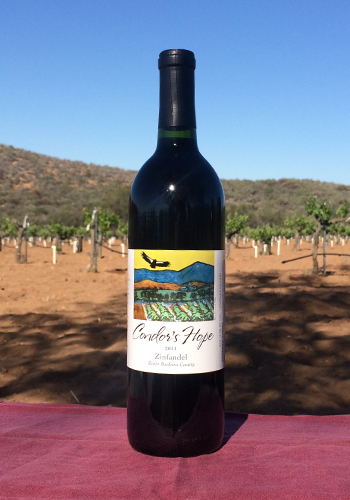 So in addition to our own Zinfandel, our winemaker JP Pawloski crafted this wine for Condor's Hope from the dry-farmed vineyard of the Wirz family in the Cienega Valley, grown in the same dry-farmed, head-pruned style as ours. With the small organic grapes that contain no irrigated water, you'll find the same full body, complexity and nuances that Condor's Hope Zin is known for. You will notice the fruit forward cherries, followed by a spicy peppery finish. The second year of drought lowered yields and increased the intensity of this Zin that has the essence of black cherries with pepper on the finish. Released December 2015, it is drinking smoothly now and this classic dry-farmed Zin will develop fully with more time in the bottle. Only 65 cases produced. Grapes harvested in their prime in a drought year. Black cherries lead to a robust, fruit-forward essence. The finish hints of chocolate with a touch of vanilla. Bottle time should give this vintage the depth and jam characteristic of drought year harvests. Drought stress and an early harvest produced a fresh ‘easy-to-drink’ Zin with light raspberry overtones followed by a lingering pepperiness. This unusual wine is lighter than our other vintages, with a body closer to that of a young Pinot Noir. Tastes of black cherries and tart raspberries come to mind. Soil moisture from the year before produced a well-balanced, abundant, forward fruit with a finish that hints of spicy chocolate. Full, rich mouthfeel. Matured beautifully in the bottle. Classic fruit-forward flavors of rich raspberry and ripe blackberries. Normal rainfall and ideal summer temperatures during ripening produced this very well-balanced wine. Taking on the jammy essence of an aged Zin.